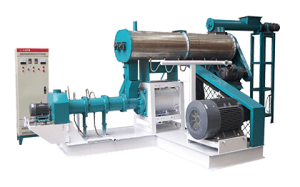 During the process of fish feed pellets production, it is vital that fish feed extruder can produce pellets normally and safely because pellet preparation totally depends on the pellet making machine. 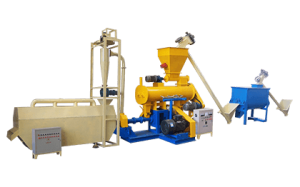 As one of the primary key equipment for feed enterprises or fish farmers, the good running of fish feed extruder pelleting machine directly influences economic benefits of feed plants. However, in the actual production, it is not difficult that the extruder is blocked before products expelled from die hole, causing the common pelletizer blocking phenomenon. In the process of extruding, raw materials are transported from feeding hole to the whole extruder chamber via screw, so the clearance between the extruder screw and puffing chamber is very important for fish feed making. In order to reduce the possibility of clogged phenomenon, in the actual production, the operating personnel should pay attention to adjusting the clearance between the screw and puffing chamber on the basis of the best status formed by compression roller and environment during regulation, and according to tests, the lower gap is about 0.5mm-1mm while the upper gap is around 1mm-1.5mm, and keeping the right-and-left gap basically the same is ok. For achieving this point, it is the experience and adjusting hand feeling of granulating workers that seems quite important. In general, the major elements of the most ideal production condition in the producing process of pellet fish feed contain the suitable raw material and water content, the excellent steam in quality, and the sufficient hardening and tempering time. Using dry saturated steam for granulation properly can help to efficiently increase the yield of fish feed extruder and improve the quality of fish feed pellets at the same time. Therefore, for ensuring high quality and high yield pellets, granulating workers also need to make sure the quality of dry saturated steam entering the conditioner of extruder machine, except that each driving part of feed pellet extruder machine runs well. The appropriate saturated steam can play a part of softening and lubrication in the process of pelleting, which can promote the rate of production, lower the friction heat energy, and prolong the service life of machine. In the meantime, it also has the ability to bring down power consumption, expedite the jelling of starch and the cementing of fiber materials. Besides, the saturated steam can increase the shaping rate of feed pellets and decrease powder materials, which makes materials with smooth and tidy appearance, thereby enhancing the competitive power of fish feed pellets. The pressure of steam is not high enough and water content ratio, both making it easy for materials to absorb too much water, while when pressure is low, the temperature of materials in tempering is also low and the starch cannot be in good gelatinization, then the effect of pelleting would be poor. The pressure of steam is not stable (sometimes high and sometimes low), and the tempering situation of materials is also steady, which leads to the big current fluctuation of fish feed extruder machine and the uneven dry and thirsty of materials, then easily to result in the blockage of machine in the normal manufacturing process. Pelleting workers need to pay attention to steam pressure, conditioner, feeding volume and other kinds of factors at any time, avoiding too high water content of material tempering caused by steam pressure and high moisture. In the meanwhile, for the purpose of reducing the times of machine blockage caused by steam quality, the boiler room needs to provide the high-class and steady dry saturated vapor. Additionally, pelleting workers also need to keep a watchful eye on material water content after tempering at any moment by using a simple and easy way to discriminate, and here is the detailed method: catch a handful of materials out of conditioner and hold as clump, if the clump just scatters after loosening the grip, then that is appropriate. As is well known, for pellet feed meeting the competitive demands of market, suppliers must make sure the quality of fish feed pellets are excellent. 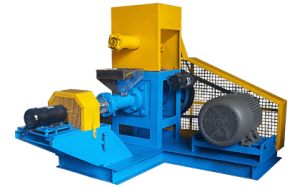 Before pelleting, the tempering effect of materials is of great concern because it directly affects the production capacity and pellet quality of fish feed extruder machine. Especially, the stability in water of special-type aqua feed is also an important index, if materials cannot get enough tempering and ripening before pelleting, then the index of water stability would be hard to guarantee. This so-called tempering refers to the preprocessing of powdery material before pelleting, and the process of fully stirring and absorption of the granulated powder and the appropriate amount of steam within the conditioner. Choosing tempering equipment in line with the technical requirements can make materials fully stirring and mixing with steam within conditioner, achieving the effect of softening materials and pasting starch, beneficial to powder compacting and shaping and producing the products up to standard. The conditioner should have heat preservation, heating and moistening function for a long time, which can make sure materials fully meet the tempering requirements, improving the surface appearance and inner quality of pellet feed, and enhancing the feed stability in water.